The fabric industry is one of the most ancient industries in the world. Historically, fabric was manufactured using various manual methods, but today most fabrics are manufactured by sophisticated speedy machines. The principal methods for fabric manufacture are weaving and knitting. Fabrics also differ from one another in the fibers they are made of, either natural or synthetic. Choosing the right fabric is critical for creating a successful item. In the process of generating an idea and a sketch, I choose the type of fabric, its color, pattern and texture. I love natural woven fabrics with a gentle feel and interesting patterns. When designing the shape, I always prefer that the fabric be far from the body; it’s more feminine and comfortable in my eyes. A solid skirt requires a firm fabric, while a fluid one requires a soft fabric falling nicely on the body. Sometimes matching the fabric to the design based on a spread roll of fabric can be difficult and misleading. At times when working on a new model, only after sewing the item and trying it on do I realize that the fabric doesn’t match the model or meet my requirements. In this post I present to you a chiffon blouse 'circles' composed of two layers. The top layer is chiffon with retro style green and brown circles, and the bottom layer is cream colored washed chiffon, soft and snug. The idea was to create a blouse that was somewhat opaque, so you could wear it in the summer without another layer underneath. The blouse can be worn over a skirt or trousers for a light and relaxed look, or tucked-in for a more elegant look. 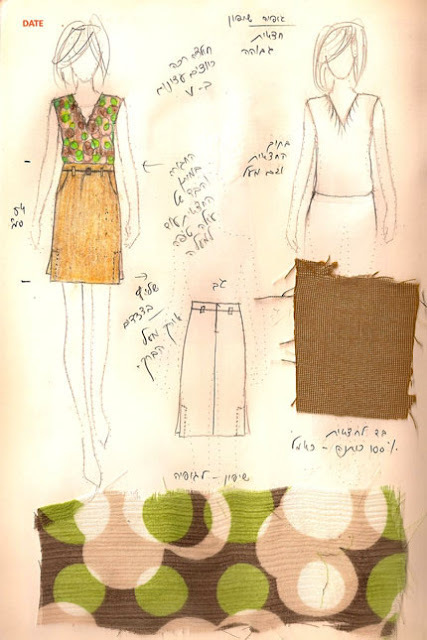 The skirt is 100% camel shaded cotton with a Pepita pattern. Its shape is straight and the waistline is high. I created an illusion of a lower waistline by placing loops a little below the waist. Two front pockets with a diagonal opening and a hidden back zipper create a clean look. In the bottom part, on both sides, I added deep slits for a feminine look and a comfortable walk. I’m designing this blouse and this skirt in various colors and patterns, which I plan to present in the following posts. See you! what an amazing chic! I want to wear all of it! What's so great is that these looks can be worn in Tel-Aviv ( i assume) as well as Paris! lovely look. Very unique colors and good combination of them. Great colours and lovely skirt shape. The whole look is so perfect! Can be appropriate as an evening or morning outfit, which is amazing. Perfectly designed skirt,what kind of fabric did you use? Was that like the fabrics that are used in mens suits? I kinda like it.